Sorry for not keeping up the Christmas spirit and cheer. It's a combo of busy, feeling lethargic and a bout of the Christmas blues. So I can only apologise for my absence and countdown lateness. 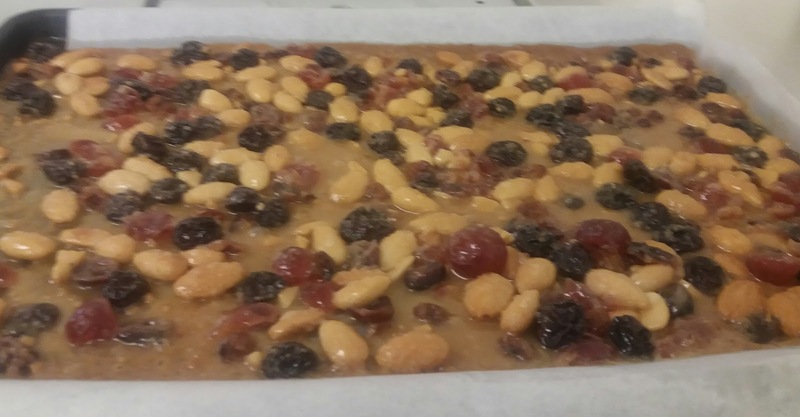 Recently, I've a little a bit like Mrs Beeton and wanted to craft and make some Christmas goodies. This is part of the inspiration has been watching Kirsty's Handmade Christmas. This Christmas I've been glued to the television watching my favourite Christmas programming host presented by Kristy Allsop. Who originally started her career on a property a TV show and expanded her into home decor programming. I really enjoy her programs as they appeal to my love of old stuff (I occasionally use the word vintage I now detest this the overuse of this word), crafting, and quirky decor. I fell in love with her first programming focused on re venerating her Cornwall Property with second-hand finds, decor and British crafting. She presents her first Christmas programming on to do a Homemade Christmas, and I fell in love this concept and aspire to do this at some point. Her shows have expanded to the point where you can still they show are so varied and often include competitions. I can understand that they need to expand into different crafts and not repeat the same ones but I feel the latter programs have lost their simple charm of her original Christmas program. It still makes it feel like Christmas and stimulate a bit Christmas spirit I feel. I mentioned this one last week and was so simple. 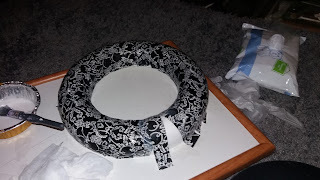 A while ago, I purchased a styrofoam circle with intention of making a Halloween wreath but I never came to fruition. 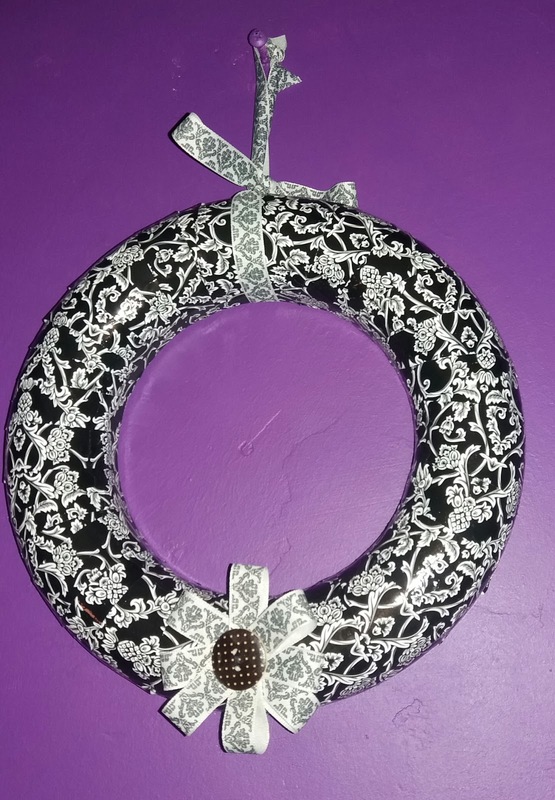 I've made a black and white wreath as I'm not one for following traditions, and I like things that can have multiple uses. I used some old wrapping paper from a previous project. The final product I sprayed with lacquer to protect and give it a glossy look. 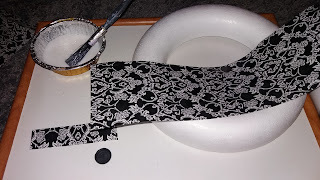 I tried a damask ribbon and a made a small flower by sewing making a small loop and sewing it each piece together, Then I sewed the button. I can't and love being a bit different. My favourite colours are black and purple add a dash of white and grey it makes for a great colour combo. I've set up my sewing machine and crafting area in what will be our guest bedroom for a temporary stay until I sort what will be my crafting room. I've been catching up with some overdue sewing and finishing projects off. For the last couple of weeks, I've had the hankering to sew a stocking and finally I've sewed one. It's not bad but a bit wonky donkey, as I've never made one before and didn't read any instructions until it was too late. I'm not going to suggest how I did mine I found this great tutorial that helped salvaged my stocking. 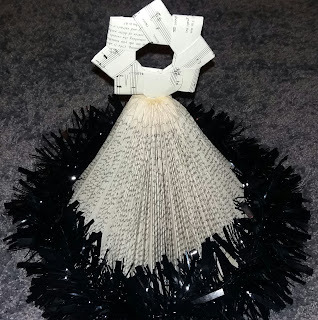 Christmas Book tree and Origami star. I don't how long I've wanted to do this but I finally made a Christmas book tree, glee and little star. The Library I've volunteered for opted to have Christmas crafty morning with a cuppa and nibbles, which suited me down the ground. I swear I was a gentile lady in a past life with ladies craft and a cuppa. 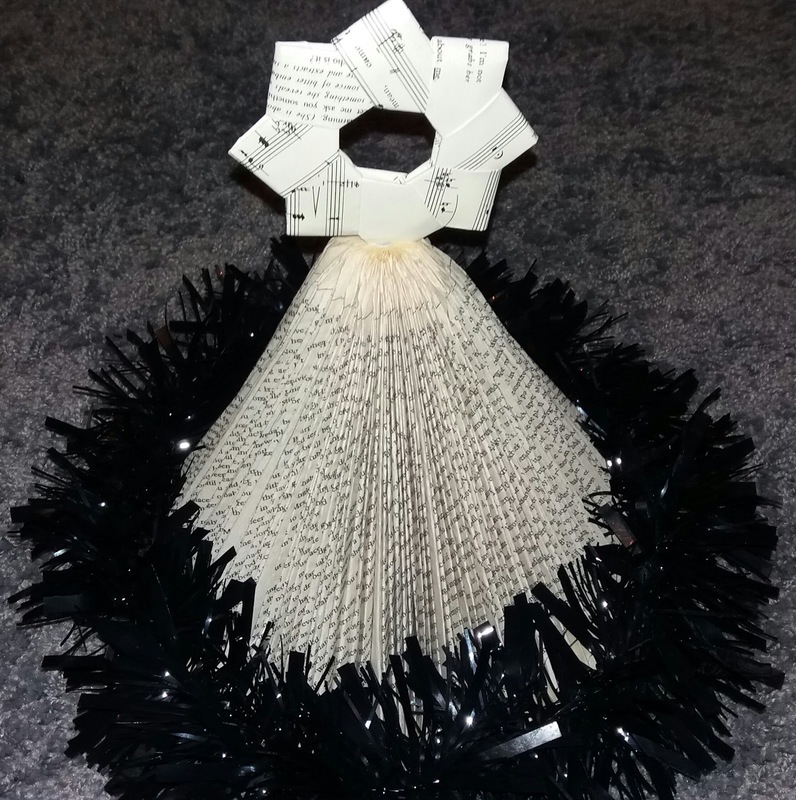 So we made Christmas book trees and an origami star, which I anticipated to be incredibly difficult it turned out to be rather simple. Again, I'll recommend a tuition rather than explaining it. 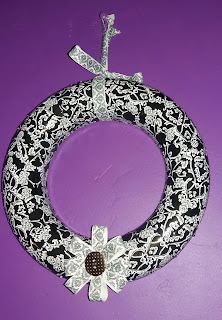 This my final version, and I couldn't resist the black bit of black sparkle by adding black tinsel. 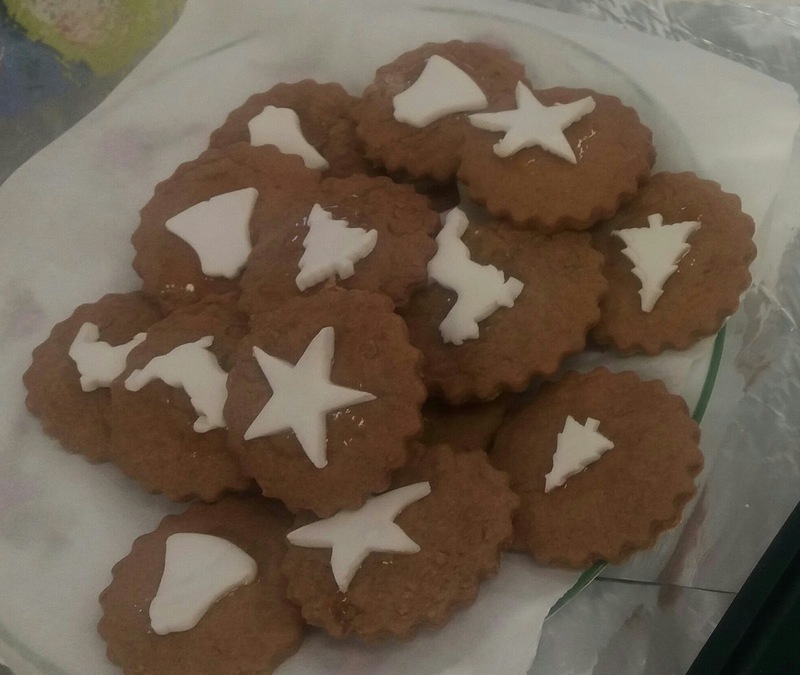 A few week ago, I attended a local cookery morning to make Christmas sweets which seemed interesting and proved to stimulate some inspiration. Below were the recipes we used to make to make the Christmas treats. Gently melt the butter, muscovado sugar and syrup in a large pan until the sugar dissolves. Mix the flour, spices and ½ tsp salt. Cool the butter mixture a little, then stir in the baking powder. Immediately add half the spiced flour and beat well. Add the egg and the rest of the spiced flour, then beat well again until the mixture comes together as a soft dough. Tip onto a sheet of foil, flatten into a large disc, then cool and chill until firm. Will freeze for up to 6 weeks. Fold the icing sugar in carefully into the cheese carefully so it doesn’t billow, add colouring and extract till everything is added, shaped into 2 cm balls and flatten slightly and place onto greaseproof, and place into fridge in airtight container. Mix condensed milk and icing sugar together add coconut, the mixture will be quite stiff, divide in half. Colour half the mix a pale pink. 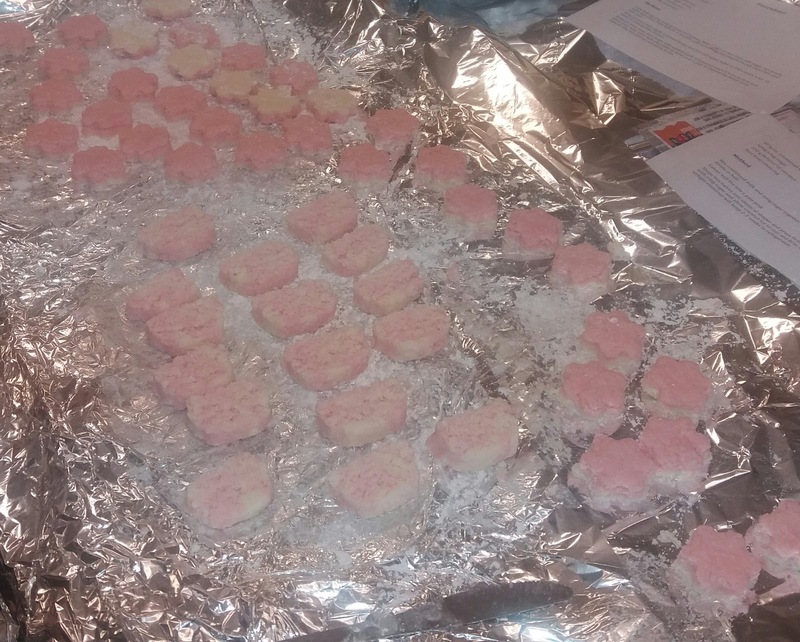 Shape two halves into identical shapes and press firmly together, dust work surface with icing sugar and allow coconut ice to rest and firm, Curt into pieces and store in an airtight container will keep 2-3 weeks in the refrigerator. Line baking tray with greaseproof paper, Melt butter on low heat, add sugar, eat gently until dissolved, then boil for 1 minute, add remaining ingredients except chocolate and mix well. Drop mixture into small rounded heaps spaced well apart, bake at 180c mark 4 for 10 mins or until golden brown. Below is my attempt at making ginger biscuits I slightly adapted the recipe with a few things and used self-raising flour. 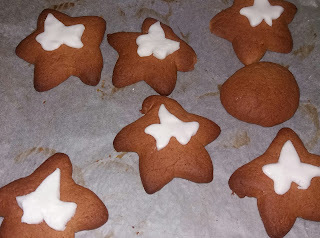 I think, I need further practice but a good excuse for baking something new. 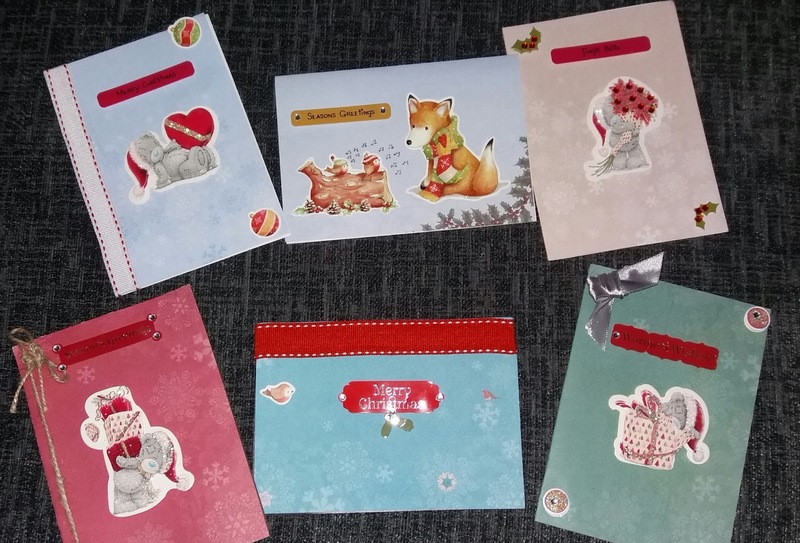 This year, I've even attempted to make homemade Christmas cards for my family using a combination of trims, cards, premade card appliques and stickers with buttons. 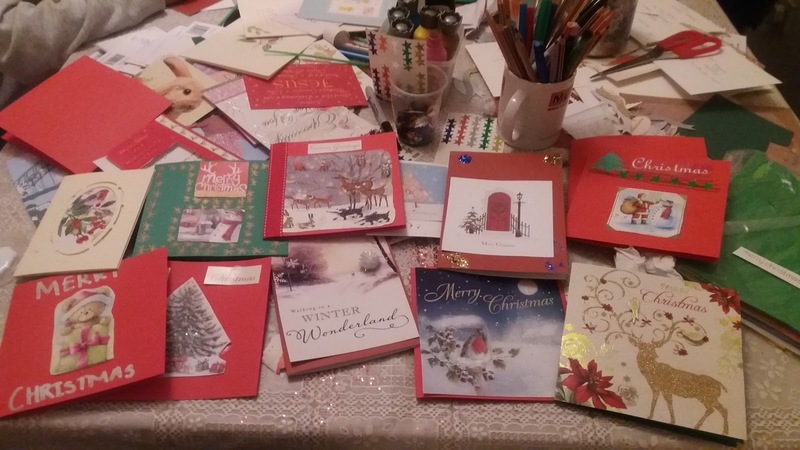 I've always wanted to make handmade cards, Just I found it hard to know what to do or design to create and paranoid about their ascetic not being good enough. I've just stopped and thought go for it. The only success was a homemade scarf, which only required the edges to be overlooked so a non-fail even for me. I had the idea to make bath bombs, which ended in complete failure. I substituted Epsom salts for sea salt, as recommend by numerous recipes.Turned out to be. wrong. My boyfriend gives me a basic chemistry lesson explaining that the Epsom salts were magnesium sulphate and the sea salt is sodium chloride. to completely different compounds, a complete fail. Instead of throwing away I'm going to use them bath salts. Not a complete loss. Wow, you are a talented crafter! Everything looks great! Thanks I think in the new year, I wanna take up soap making and do bath bombs. As I quite like things like things Lush but feel the products are very expensive for the price and some their ingredients aren't as all natural as they claim to be. Everything you've made looks absolutely wonderful! 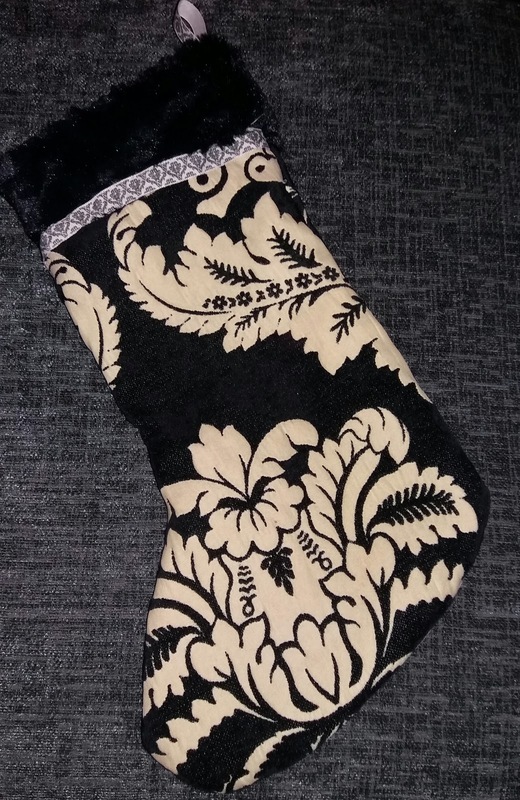 I don't think the stocking looks wonky at all, I think it looks really good! Amazing job! Thanks it was fun doing everything, I think in regards of the stocking I'm trying to be a perfect my sewing skills and I guess I'm worse enemy. I addict to stroking it's black fur as reminds of my old Cat Morganna's fur. I'm usually the same for years I lothed Christmas and I've became less lothsome but I detest all the ccommercialism associated. I think Iit's Im feel a bit excited as its my first in the new house. (sorry if this posts twice, I'm having a bit of a commenting issue). Thanks same to you. It'll be great if we can meet up again just contact me when your their. Its only a short walk for me. Wish you all the best for the new year. You really have been busy off-line - good for you! I discovered Kirstie last year and really liked her show too. I guess I kind of have lol. I usually go with my feelings and often sometimes I like to be away from tech or social media. It's nice to hear that you like her show. Her show always make it feel like Christmas. Merry Winter Holidays. I do like some of the Nordic German Christmas traditions. Well, I think you've done very well Sarah! Everything looks amazing! You've been busy! Merry Christmas! Thank you that so sweet. 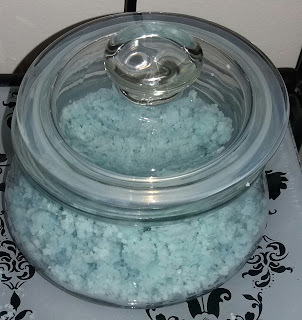 I actually used sea salt in my cupboard but next time I will try with Epsom salts. If you have achy muscles I've learnt that any kind salt works even table salt for achy muscles in bath. I told my younger sister about them and she didn't seem keen on the idea. I'm happy opting for a mug with marshmallows and hot chocolate. Always great for the winter season.